It’s Friday night, and I’m kicking off the weekend with another entry in my weekly toy series, Funko Friday, as I batten down the hatches for the impending blizzard. Tonight, I have chosen Funko’s Pop! vinyl version of Robocop as my subject. The namesake of the obscenely violent 1987 action movie, Robocop was formerly known as Officer Alex J. Murphy, who was shot to pieces by a group of criminals, only to return to the force, half-man, half-machine, to take out the trash on the streets of crime-ridden Detroit. Played in the movie by Peter Weller, Robocop, even after his pseudo-reincarnation, was troubled by memories from his past life, despite being successful in mopping up the dregs of society with his own special brand of justice. After gaining notoriety for victories, he finds himself the target of a massive villain by the name of Clarence Boddiker (Kurtwood Smith, well-known as the hard-nosed Red Foreman in That 70’s Show). One of the thugs who participated in Officer Murphy’s grotesque mutilation was Emil Antonowsky, who was played by Paul McCrane. McCrane experienced some mutilation of his own as Dr. Robert Romano on the long-running hit hospital drama ER, as he had one of his arms chopped off by a helicopter blade when he got too close, and was ultimately killed by a falling helicopter in a completely separate incident. It seems that his sins from Robocop followed him to another character. As what was left of Officer Murphy’s body was reconstructed inside of this mechanical suit, all that is visible of his skin is merely the bottom half of his face. Funko’s rendition of the armor-clad hero is fairly impressive when dealing with such a small amount of vinyl real estate. 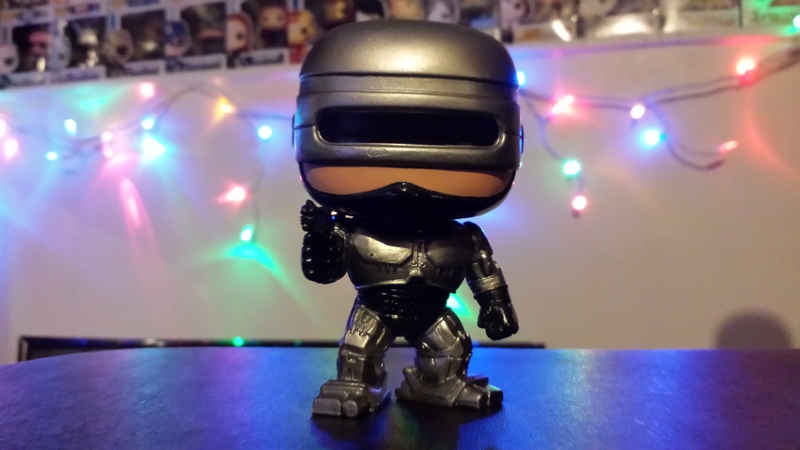 It appeared for a while that Funko was attempting to steer clear of super-violent characters for their figures, but they went along with Robocop, much to my enjoyment (although, we’re still missing figures for Die Hard, Lethal Weapon and Terminator). If you’ve never seen the original Robocop, it is one of the most memorable action movies from the 80’s, and overall, for that matter. It’s not one for the kiddies, or the faint-of-heart, but for those into good-vs-evil shoot ’em ups, it’s a masterful cinematic romp. Come back next week for another peek at one of Funko’s Pop! vinyl figures, and the story behind it! In the meantime, check out the rest of my ever-increasing stock of written words on beer, movies, music, and life at noseatbeltblog.com!